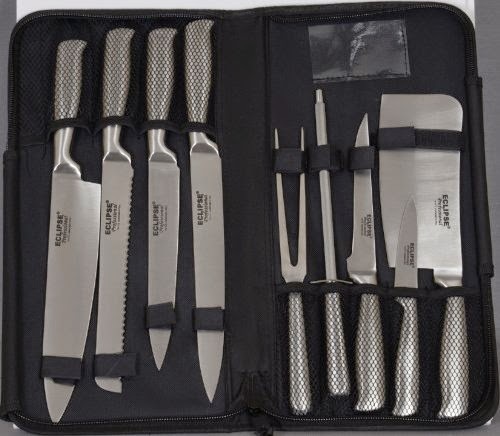 For my 10th giveaway I'm offering one lucky reader a 9 piece Samurai Knife set from Buy Catering with a RRP of £129.95. Buy Catering are an online store mainly for restaurants and cafes, but they are also available for the home cook. You will find some great prices on kitchen and baking basics. 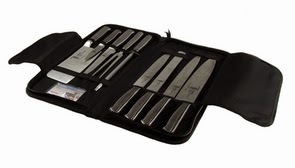 This Samurai knife set is normally £129.95 but on sale at the moment for £69.95. A great gift for any keen cook. Leave me a comment telling me who your favourite chef is and enter via the rafflecopter box below (it may take a moment or two to load. This giveaway is open to UK readers and closes on 30 December 2014. I don't have a favourite - though if I had to pick one TV cookery icon it would have to be Delia Smith because her book taught me how to cook. Really in need of some decent knives! Nigel Slater imaginitive but not too fancy! My favourite is Lorraine Pascal she makes baking easy. I like Jamie Oliver because he often does veggie recipes and all his food looks amazing! Atul Kochhar , I love his fusion of tastes. My mum - I'm going on the premise that the question didnt say which known chef! Cas Clarke because my Grandad gave me a book Grub on a Grant when a student and I learnt to cook from that book. Jamie Oliver because he makes cooking accessible to all levels. I love his 'good food' ethics too. My favourite chef is my mum. But seeing as you mean celebrity chefs, I will go with Delia Smith. It has to be the master of Simple yet Brilliant, Nigel Slater. I have a soft spot for Jamie Oliver! Nadine Abensur, she used to work for Cranks before moving to Australia. Hugh Fearnley Whittingstall, going veggie for a year gave him an insight into vegetarian food which a lot of chefs don't. He'd describe himself as a cook not a chef, I think, but Nigel Slater. Jamie Oliver....I love that he is putting more veggie and vegan recipes online! Jamie Oliver is top dog!! Does some really simple but good stuff! Probably has to be Nigella but I met Eric Lanlard recently and he was lovely! Jamie Oliver as he makes proper food suitable for everyday eating. All Hail the Mary Berry!!!!!! Jamie Oliver, by far and away the most enjoyable to watch and a genuinely nice guy unlike Mr Ramsay! my favourite chef at the moment is my husband, my leg is in pot so relying on him to cook and prepare all my meals and he is wonderful!! I'd have to go with Massimo Bottura. Jamie Oliver, nice and simple recipies that work out! Keith Floyd. The daddy of today's tv chefs. I don't have one. Hmm. I like Gordon Ramsay as I love watching him turn around failing businesses and seeing the transformations. Don't really have a favourite celebrity chef, So would have to say my wife when she's cooking the dinner. I have always liked Jamie Oliver!! Jamie Oliver, he inspires me. I like Martin Yan, and I learn Chinese cooking from him by watching his cookng shows. Jamie Oliver - Although i do find his chilli obsession a bit irritating at times. chop, chop, chop...ow my fingers!